Is a Pressure Cooker better for making Stock? You may not believe this, but until recently I did not own a pressure cooker. I didn’t know much about pressure cookers and I never really saw the need for one. I knew a pressure cooker cooks at a higher temperature in a shorter time, but since I’m mostly interested in cooking at a lower temperature at a longer time (such as sous-vide), that doesn’t seem very appealing to me. After some of my gourmet friends told me that it really worked better for making stock, I decided to buy one. Of course the first thing to try it with was homemade stock. Is a pressure cooker really better for making stock? Time for another side-by-side experiment! I decided to make a white chicken stock. I used the same ingredients as for brown chicken stock, but instead of browning the chicken and vegetables in the oven first, I blanched the chicken in boiling water. I then discarded that water. The blanching is supposed to improve the flavor of the stock (I haven’t done a side-by-side check of that yet) and it helps to prevent scum (that clearly worked). I put exactly the same amounts of ingredients and the same amount of water (1 liter/1.1 quart) in the pressure cooker and a regular stock pot. I covered both, brought them to a boil, then lowered the heat. I cooked the stock in the pressure cooker for 1.5 hours, and in the regular stock pot for 3 hours. 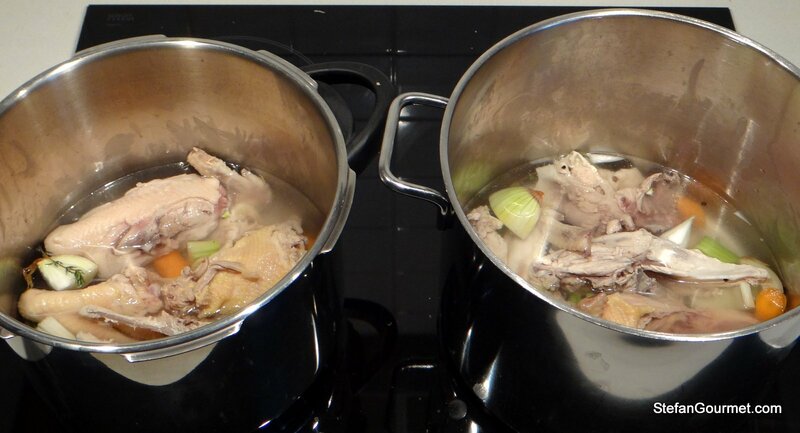 Both needed the same power setting on my induction hub, so the pressure cooked chicken stock required only about half of the power compared to the regular preparation. I allowed the pressure cooker to release the pressure slowly. At the end of the cooking, I filtered the stock with a paper towel. 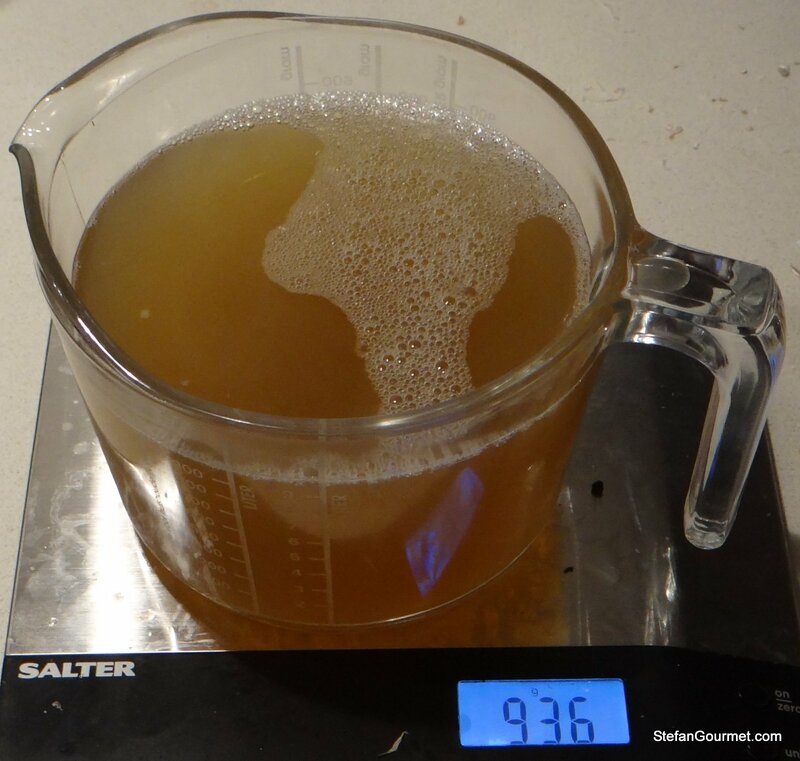 I measured the pressure cooked stock to be 936 ml. 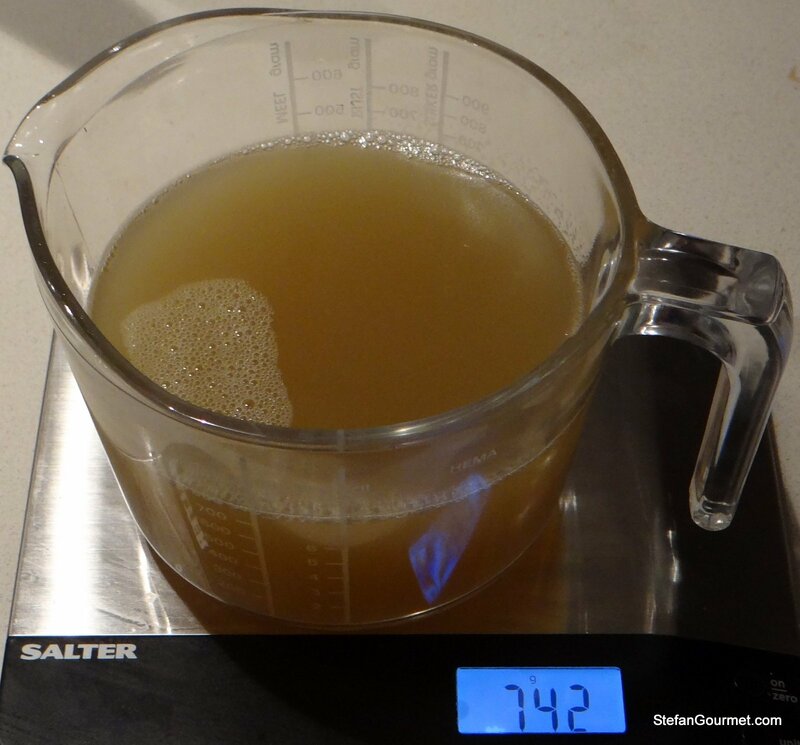 More water had evaporated from the regular stock, as only 742 ml was left of that. To make it a fair comparison, I topped it up to 936 ml as well. 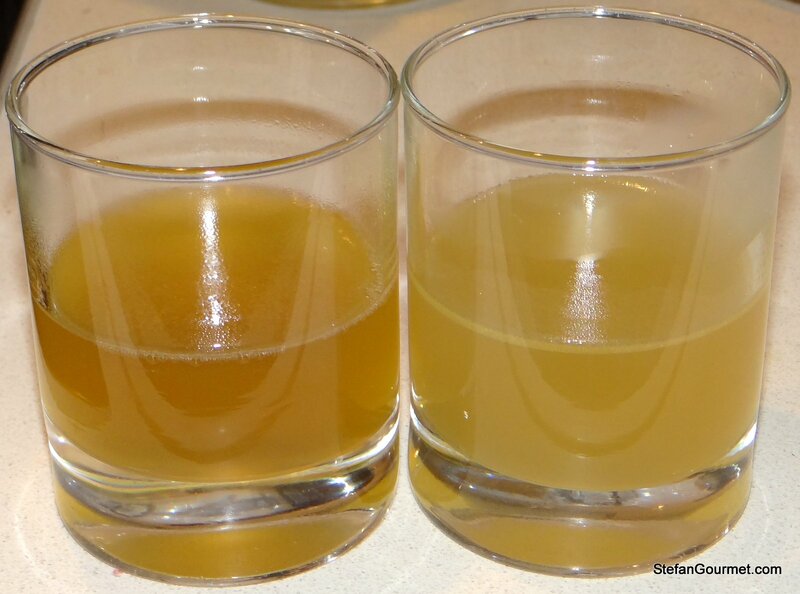 The difference between the pressure cooked chicken stock (on the left-hand side) and the regular chicken stock was clear to be seen, but more importantly to be tasted. 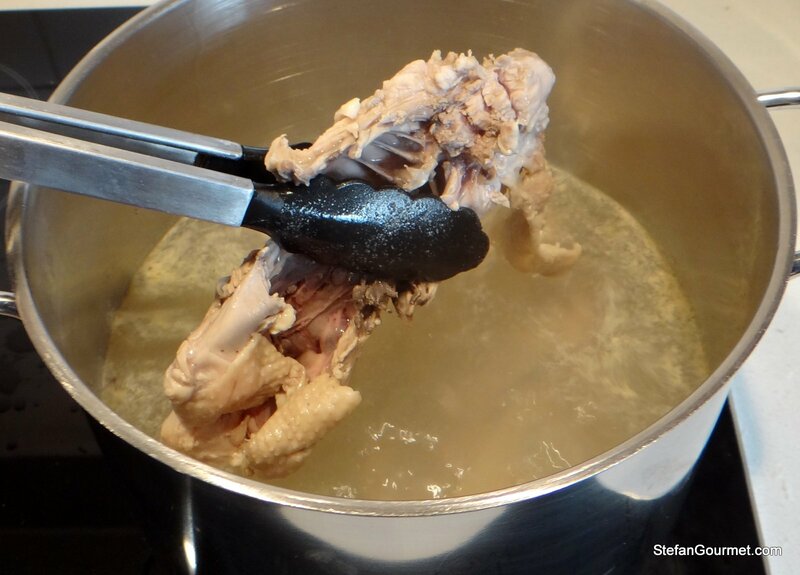 The pressure cooked chicken stock had a significantly deeper and fuller chicken flavor than the regular chicken stock. This was expected after my friends’ advice, but I had not expected the difference to be so significant. The verdict is clear: from now on I will be making stock in the pressure cooker! Damn it! Now I have to buy a pressure cooker! Is there no end?!!! At least a pressure cooker is cheaper than a sous-vide. The main issue is enough space to store everything! I really enjoy your blog. Well done! 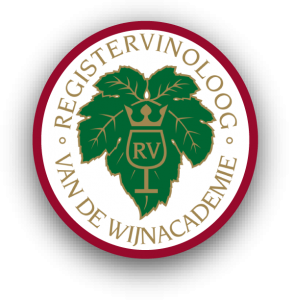 What is the name of the biggest cooking utensils store in Amsterdam? When I am in Amsterdam I like to browse the Studio Bazar at Reguliersdwarsstraat 60-62. It is a small shop but it is visually entertaining. I already own a pressure cooker and have been reluctant to make chicken stock the regular way because it takes a long time. But now I am convinced to make it your way: in a pressure cooker. No only will the time be cut in half but the flavor will be deeper and more intense. Thank you! I have a friend who lives in Belgium and he has told me about their vlaai. I’m going to tackle your recipe for vlaai soon. I was born in Hawaii and I live in San Francisco. One of my favorite desserts is pineapple upside-down cake. Have you ever heard of it? I bought one today which was baked in a muffin tin. It was very cute and very delicious. Hi Clayton, thanks for leaving such a nice comment! The store I talked about is Duikelman near the Albert Cuyp market. Great that you will be trying to make vlaai. Would love to hear how it turns out. Great experiment. I am at the stage of having to decide which pot to throw out if I buy another one. The pressure cooker will have to wait. We have what, in the US is called an “eat-in kitchen” which basically means a space off to one side where you could put a small table and chairs. We never considered it. We lined the walls with stainless prep tables with shelves underneath. Blender, mixer, sous-vide, electric griddle, vacuum sealer, deep fryer . . . alas, we keep the pressure cooker in a cabinet. And now I will have to start using it as my wife has been trying to get me to do for ages. Was planning to make chicken stock this weekend anyway . . . Sounds like a nice setup. I have something like that in a small room adjacent to the kitchen, but it’s quite full as you can imagine. I love these comparison experiments you are doing. Hope you will keep it up – I feel you are like our private test kitchen. I totally trust you but I still won’t buy the pressure cooker – I never liked it on principle or, most likely, I was always afraid of forgetting it and end up with a major explosion in my kitchen! Grazie, Claudia. Mi piace sapere perché un metodo per fare qualcosa nella cucina è il migliore. Pentole a pressione non possono esplodere, perché hanno una valvola di sicurezza. Non c`è alcun rischio aggiuntivo rispetto ad una pentola normale. Non c’è nemmeno un avvertimento nella guida dell’utente. Thanks Jo. It did feel a bit old-fashioned to buy one, but I’m glad I did! Awesome post Stefan, I’ve been using my pressure cooker for years and I love it. The reason flavors are deeper and richer is possibly due to the fact that a level of maillard reaction takes place (even for a white stock preparation, it’s hot enough in there for a slight browning to take place) , and the aromatic components don’t have an easy way to escape the pot, hence staying in the stock. Beef stew is one of my favorite thing to make in the pressure cooker as well as ragu. Love your side by side comparison, really helpful! I thought the same as you. I think world pressure cooker sales are about to skyrocket thanks to your side by side testing. I have never owned or used a pressure cooker, but if a chicken stock has a deeper richer flavour I’m convinced! Thanks, I love these comparative tests. What’s next? Thanks and LOL 🙂 I’m not sure yet what will be next. On my list are more roasted potato experiments and brining. I thought that everyone used their Kuhne Rikon pressure cookers for stock etc. They seem to have gone out of style, but are being rediscovered thanks to Modernist Cuisine and the like. I am really enjoying your comparison posts. 😀 This test is great even for the already converted pressure cooker users. Over a 30 year time period, I have gone through several pressure cookers. I use a pressure cooker mainly for beef (big chunk cut stew or pot roast meats). Not only for the depth of the flavor, but also cutting the cooking time by one-third. Great post, Stephan! Thank you. Thanks 🙂 Pressure cookers seem to be out of style, but it does seem to work very well. Very interesting, but I don’t like the straining through the paper towel. Lots of chemicals used in the making of paper towels and I don’t want to have any of that in my final product. 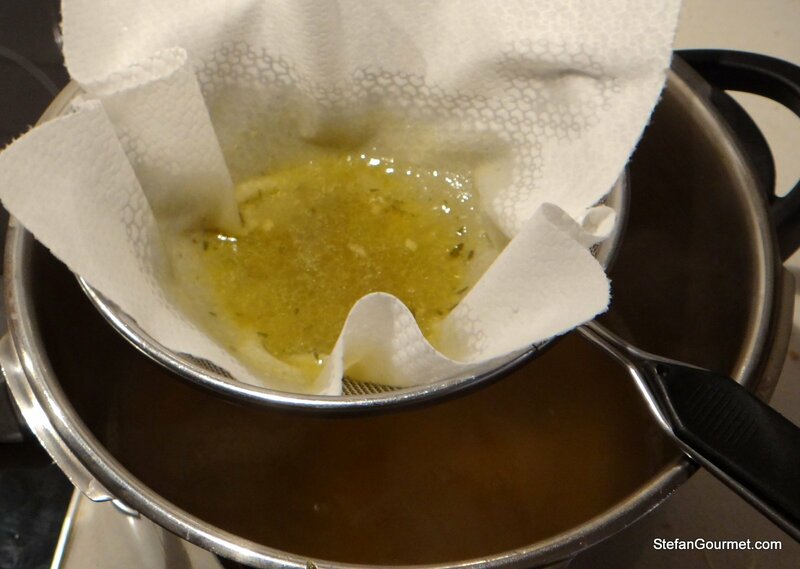 I would rather just strain out the big bits directly through the fine mesh sieve and then, when cool, skim off the fat if needed, and avoid using the very bottom of the batch if too many solids have settled. Plain muslin is another option if you really have to have it completely strained. Just a thought. I’ve just bought a cheese cloth for that very purpose the other day. It is a bit more hassle as it needs to be washed, but I do see your point. Thanks for following my blog and taking the time to leave such a thoughtful comment! 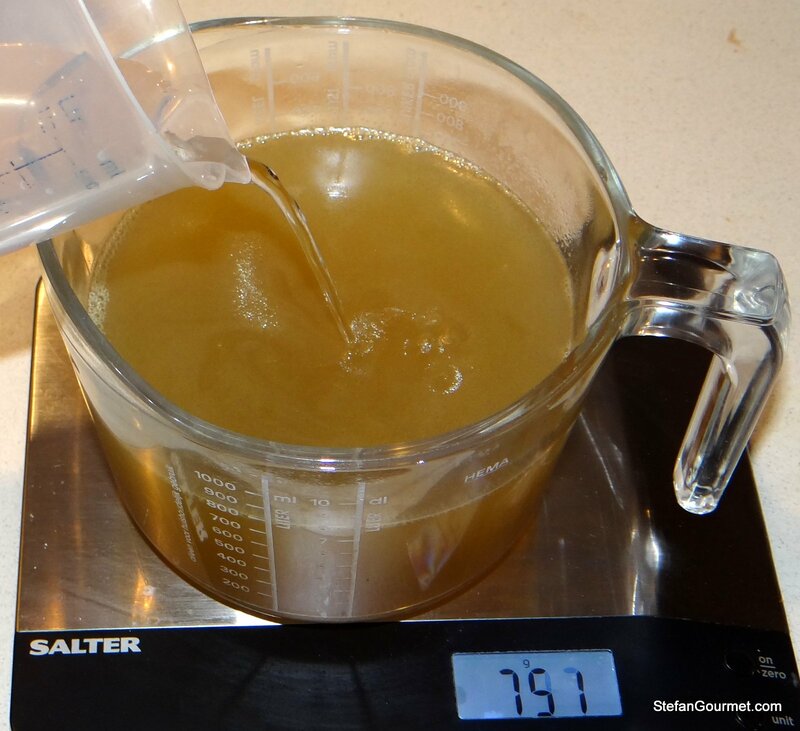 Though for a fair comparison it makes sense to top up/dilute the evaporated stock with more water to the same volume as the pressure cooked version, I’d also be interested to hear how the evaporated version compares to the pressure-cooked version. For both versions, you already cooked on low heat, which is the recommended practice. I thought of that too, but unfortunately too late, i.e. after I had diluted the one 😦 I am pretty certain though that the difference wasn’t just the dilution. Interesting post, Stefan. I don’t have a pressure cooker and had a particularly bad experience with one so they’re not on my list of things to buy. Of course, with the Boston marathon attack, people are looking at pressure cookers a little differently of late. I am interested, however, in the flavor of the stock without watering the regular stock down to match the volume. They seem to look similarly colored. What were your thoughts? I forgot to taste the regular stock before watering it down 😦 But I did think there was a difference in flavor other than the dilution. The pressure cooked stock wasn’t only stronger in taste but also deeper and rounder, if that makes any sense.